Unlimited CKO Kickboxing classes come with this fall fitness challenge. Photograph by Shaun Luberski. You know what’s hard? Staying on top of your health and fitness goals through alllll the temptation the holidays throw our way. From leftover Halloween candy to Thanksgiving to Hanukkah and Christmas, there are some pretty indulgent days coming up on the calendar. But this fall doesn’t have to be a time when all your plans for healthy living go out the window, and here to keep you on track is a new, 10-week transformation challenge, kicking off on October 22 and running right up to December 31. 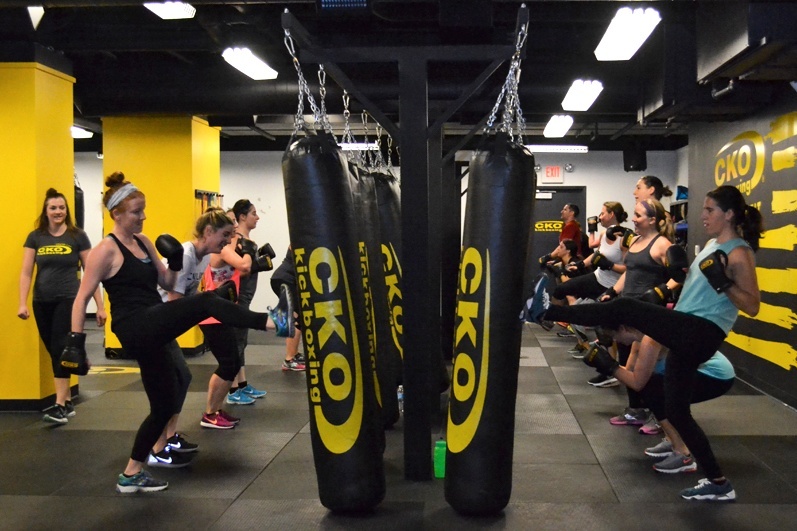 The challenge, hosted by CKO Kickboxing Center City, will include an unlimited membership to the CKO gym — that means all-you-can-handle cardio kickboxing classes and small-group training sessions — as well as a fitness assessment. CKO has also partnered with Best of Philly-winning OnPoint Nutrition, who will provide unlimited access to their nutritionist and app. Meaning, if you’re out to dinner, you can totally text their team and ask what to order. There will also be some other fun activities sprinkled throughout the challenge, like a cooking demo with Performance Meal Prep, a grocery store tour around Thanksgiving, and a nutrition class with OnPoint. The addition of a nutrition component to go with the workouts is really what set this fall fitness challenge apart in our minds. As we all know, abs are made in the kitchen (although we can personally attest to the fact that CKO’s classes will make you very sweaty very fast). Curious to learn more about the fall fitness challenge? CKO, OnPoint Nutrition, and Performance Meal Prep are hosting an informational session on October 14 at 3 p.m. that’ll include a free fitness assessment and help answer all your questions on the 10-week program. The 10-week program will run CKO members $249, non-members $499. (For non-members, that breaks down to about $200 a month for unlimited kickboxing classes and nutrition counseling. A steal, friends.) You can find more info on the event and RSVP here.